Architecture of the Language System: Fodorian Modularity and Representational Modularity Problems with Fodorian Modularity on the Input Side. What Is the Output of Language Perception? Representational Modularity. Differences between F-Modularity and Representational Modularity. The Bidomain Specifity of Interface Modules. The Relation of Processing to the Linguist's Grammar. Degrees of Modularity. References. Remarks on the Architecture of Language Processing Systems: The Goals of the Discussion. A Background Assumption. Some Experimental Examples and Perspectives from Parsing Studies. The Electrophysiological Record. Another Path: Language Production as a Comprehension Filter. Summary Remarks. References. The Comprehension-Production Interface: Overarching Agrammatism. Production: A Tree-Pruning Hypothesis. Receptive Abilities: A Restrictive Trace-Depletion Hypothesis. Overarching Agrammatism Examined. A Tribute to Edgar Zurif. References. Speech Perception, Conduction Aphasia, and the Functional Neuroanatomy of Language: Introduction. Evidence for Bilateral Organization of Speech Perception Systems. Evidence for Left Posterior Supratemporal Plan Participation in Speech Production. Relation between Phonological Encoding, Repetition, and Naming Deficits in Conduction Aphasia. Other Areas Previously Implicated in Speech Perception May Reflect a Network Supporting Auditory-Motor Interaction. Implications for Anatomical Models of Language. Summary. References. Overarching Agrammatism: When Comprehension Involves Production Introduction: Experiment 1. Experiment 2. General Discussion. References. The Memory-Language Interface Verbal Working Memory and Its Connections to Language Processing: Introduction. Neuroimaging Studies of Working Memory. Verbal Working Memory and Language Processing. Other Kinds of Working Memories for Language Understanding. Summary. References. Sentence Memory in Amnesia: Introduction. Encoding Deficits. Retrieval of Stored Material. Sentence Comprehension. Conclusions. References. The Lexical-Structural Interface: Toward a Neurochemistry of Naming and Anomia: Neurochemistry of Output Anomia. Neurochemistry of Lexical Semantic Anomia. Conclusions. References. Language Deficits in Broca's and Wernicke's Aphasia: A Singular Impairment: Introduction. Theoretical Framework. Lexical Processing Deficits in Aphasia. Syntactic Deficits in Aphasia: A Preliminary Proposal. Semantic Integration. References. Right Hemisphere Contributions to Understanding Lexical Connotation and Metaphor: Introduction. Neuropsychological Investigation of Connotation. Neuropsychological Investigation of Metaphor. Summary and Some Unresolved Issues. References. Aspects of Lexical Access: Evidence from Aphasia: Modality-Specific Deficits. The Organization of the Lexical System: Must We Prostulate Modality-Neutral Lexical Nodes? The Organization of the Lexical System: Morphology in Spoken and Written Language. Evaluating Computational Models of Lexical Access in Aphasia. How Good a Fit? And If the Fits Had Been Good? The Globality Assumption and the Data from Modality-Specific Lexical Deficits. Conclusion. References. Using the Recording of Event-Related Brain Potentials in the Study of Sentence Processing: Introduction. Event-Related Brain Potentials and Semantic Processing. Event-Related Brain Potentials and Grammatical Processing. Slow Potentials in the Study of Language Processing. Conclusion. References. Grammatical Gender Is Not Always Syntactic: The Nature of Grammatical Gender. How Does a Speaker Know a Word's Gender. Conclusions. References. The Time-Course of Lexical Access and the Role of Context: Converging Evidence from Normal and Aphasic Processing: Preface. Introduction. The Basic Evidence. Lexical Access and Context Effects: Evidence from Neurologically Involved and Non-neurologically Involved Populations. Differential Cerebral Hemispheric Contributions to Lexical Access (and Context Effects). An Integrated View of Lexical Access and Context Effects: Converging Evidence from Normal and Aphasic Populations. References. The Syntax-Discourse Interface Comprehension of Discourse-Linked and Non-Discourse-Linked Questions by Children and Broca's Aphasics: Introduction. Background. Experimental Results. Consistency with Other Findings. Conclusions. References. Positron Emission Tomographic Studies of Syntactic Processing Methods: Experiments with Young Subjects Using Relative Clauses. Experiments with Young Subjects Using Active and Passive Sentences. Experiments with Elderly Subjects Using Relative Clauses. Discussion. References. Canonicity in Broca's Sentence Comprehension: The Case of Psychological Verbs: Psychological Verbs. The Argument Linking Hypothesis. Predictions by the Trace Deletion Hypothesis and the Argument Linking Hypothesis. Previous and New Empirical Evidence. Discussion and Conclusions. References. A Simple Argument for Subject Gaps: References. Some Recent Investigations of Gap Filling in Normal Listeners: Implications for Normal and Disordered Language Processing: Study 1: BP-Ellipsis. The Present Study. Study 2: Wh-Questions. Experiment 1: Who and What Questions. Experiment 2: Which-NP Questions. References. Index. The study of language has increasingly become an area of interdisciplinary interest. Not only is it studied by speech specialists and linguists, but by psychologists and neuroscientists as well, particularly in understanding how the brain processes meaning. 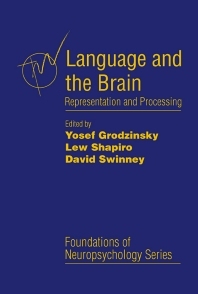 This book is a comprehensive look at sentence processing as it pertains to the brain, with contributions from individuals in a wide array of backgrounds, covering everything from language acquisition to lexical and syntactic processing, speech pathology, memory, neuropsychology, and brain imaging. Researchers in psychology and neurolinguistics, speech pathology, cognitive psychology, and cognitive neuroscience. San Diego State University, California, U.S.A.
University of California, San Diego, U.S.A.